Concerts and holiday performances in Washington, D.C., Maryland, and Virginia are part of the Washington, D.C. area holiday tradition. You'll find a variety of musical performances including Christmas classics, sing-alongs, Hanukkah songs, and much more. Concerts and Performances in Washington D.C.
Season’s Greenings at the Botanic Garden - During December 2018, on select Tuesday and Thursday evenings, the Conservatory is open until 8 p.m. with live seasonal music from 6 - 8 p.m. Seating will be on a first-come, first served basis and opens around 5:30 p.m. The Conservatory is open every day of the year, from 10 a.m. to 5 p.m., free of charge. The best times to visit for Season's Greenings and avoid the crowdes are weekdays early in December. Address: 100 Maryland Avenue, SW.
Washington National Cathedral - December 7 - 9, 2018. Enjoy the masterpiece of Handel’s Messiah, The Holiday classic is performed by the Baroque-period orchestra and guest soloists joining the Cathedral’s combined boy, girl, and men’s choirs. There is also a shortened version designated for families. Tickets are available online. Address: 3101 Wisconsin Ave., NW. The Washington Revels - December 8-16, 2018 at the Lisner Auditorium at the George Washington University. Christmas Revels - An Elizabethan Celebration of the Winter Solstice. Mummers plays meet A Midsummer Night’s Dream in this boisterous blend of high and low, city and country, art and folk, along with timeless Revels favorites: rousing carol sing-alongs, dancing in the aisles, children’s singing games, the Abbots Bromley horn dance, and the music of the Washington Revels Brass. Address: 730 21st St NW. Holiday Events at the Kennedy Center - John F. Kennedy Center for the Performing Arts. Capture the spirit of the season with these holiday concerts, featuring holiday music in diverse styles. The season runs from November through December 2018. Highlights include the Washington National Opera's Silent Night, NPR's A Jazz Piano Christmas, Ballet West: The Nutcracker and the National Symphony Orchestra: Handel's Messiah. Address: 2700 F St. NW. Cirque du Soleil - At the Capital One Arena, Cirque du Soleil presents Crystal, an ice experience, from December 5 - 9, 2018. Suspend reality and glide into a world that springs to life with astounding visual projections and a soundtrack that blends popular music with the signature sound of Cirque du Soleil. U.S. Army Chorus Christmas Caroling - On Tuesday, December 18, 2018, the U.S. Army Chorus will present caroling in the rotunda of the National Gallery of Art. There will be two performances of this free concert. Address: 401 Constitution Avenue, NW. Kwanzaa Celebration at Dance Place - On December 15 and 16, 2018, Dance Place has their annual Kwanzaa celebration. Join Coyaba Academy, Coyaba Dance Theater, and special guests to celebrate the seven principles of Kwanzaa. Address: 3225 8th Street, NE. Washington Chorus - A Candlelight Christmas - Friday, December 7, 2018, at 8:00 p.m.
and Saturday, December 22, 2018, at 4:00 p.m. at the John F. Kennedy Center for the Performing Arts: Concert Hall and the Music Center at Strathmore (see website for details). The annual return of this popular holiday program. 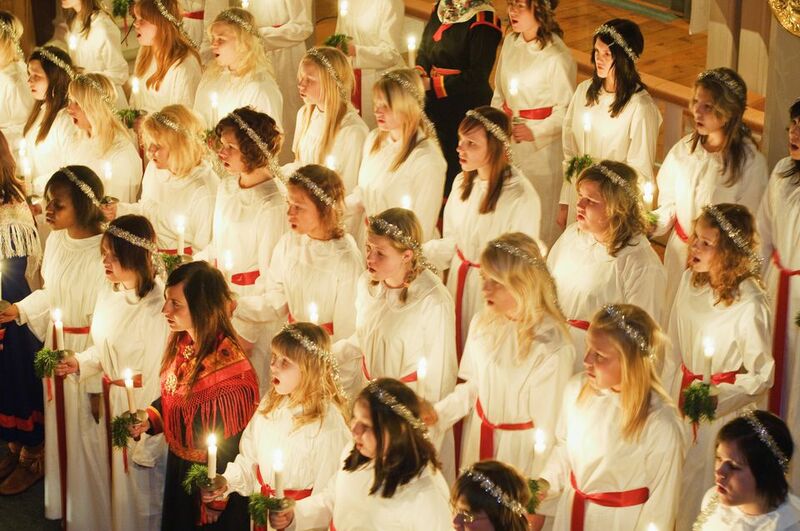 A Candlelight Christmas features traditional carols, contemporary compositions, and sing-a-longs. The festivities are accompanied by a brass ensemble and organ and include the traditional candlelight processional. Free Concerts at the Willard Hotel - Throughout December 2018, 5:30 - 7:30 p.m., the Willard Hotel presents holiday music. Enjoy performances from top choral and musical ensembles from around the Washington, D.C. Metro area. Address: 1401 Pennsylvania Ave, NW. Music Center at Strathmore - Throughout December. Performances include the Baltimore Symphony Orchestra's Handel's Messiah, Strathmore Children's Chorus, Manheim Steamroller Christmas and many more. Address: 5301 Tuckerman Lane, North Bethesda, Maryland. Bethesda Blues & Jazz Supperclub - Throughout December. 7719 Wisconsin Avenue Bethesda, MD. Performances include a variety of jazz and soulful holiday tunes. USNA Messiah Concerts - Saturday, December 1, 2018, at 7 p.m. and Sunday, December 2, 2018, at 3 p.m. in the USNA Chapel, the U.S. Naval Academy Glee Club joins with the Annapolis Symphony Orchestra and soloists from the Metropolitan Opera Company to present selections from Handel’s Messiah. Address: 108 Blake Road Annapolis, Maryland. Gaithersburg Community Chorus Holiday Concert - December 2, 2018, 7:30 p.m. at the Gaithersburg Presbyterian Church and December 4, 2018, at 7:30 p.m. at the Rosborough Cultural Arts & Wellness Center. The chorus will perform a variety of holiday favorites. BlackRock Center for the Arts - Throughout December, the arts center hosts a variety of holiday performances. Address: 12901 Town Commons Dr, Germantown, Maryland. Vienna Boys Choir - Performance on Sunday, December 9, 2018, at 2 p.m. at the Hylton Performing Arts Center at George Mason University. The choir presents its popular Christmas concert. The famous choir is composed of talented boy sopranos and altos between the ages of 9 and 14, representing 31 countries. Address: George Mason University, Prince William Campus, 10900 University Blvd. MS 5D2, Manassas, Virginia. Wolf Trap National Park Holiday Sing-A-Long - December 1, 2018, 4 p.m. Sing Christmas carols and Hanukkah songs with the United States Marine Band, vocal groups from the metropolitan Washington area. The audience is invited to bring candles to light during the last verse of "Silent Night," the final song of the program. There is also a 'Jing-A-Long' during the singing of Jingle Bells, so bring a bell along with your candle. Admission is free and no tickets are required. Address: 1645 Trap Road, Vienna, Virginia. Loudoun Symphony Holiday Concert - December 8, 2018, 4:00 p.m. at the Community Church, Holidaze will be presented. The holiday music includes pieces by Prokofiev, Tchaikovsky, and Vaughan Williams. Address: 19790 Ashburn Rd, Ashburn, Virginia. George Mason University Holiday Concerts - Throughout December. Center for the Arts at George Mason University, 4400 University Drive, Fairfax, VA (703) 993-8888. Enjoy a variety of seasonal performances.